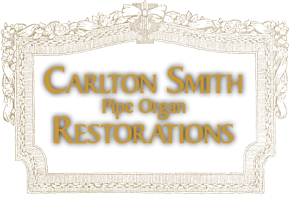 ​Carlton Smith Pipe Organ Restorations is a company devoted solely to the restoration and preservation of the Theatre Pipe Organ, a uniquely American invention. These musical instruments are the original concept of today's orchestral keyboard and very different from their counter part, the classically designed church organ. Our company is one of a very small group of qualified professional craftsman within the United States with accredited knowledge of the correct restoration of the theatre pipe organ. We perform full restorations and rebuilds of complete instruments. However, our specialty within this group of artisans is in the area of consoles and, specifically, historically accurate "art case" finishes and ornamentation restoration.